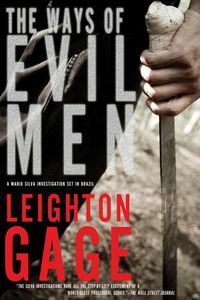 The Ways of Evil Men by Leighton Gage: Synopsis and Online Purchase Options. Synopsis (from the publisher): The Awana tribe, who live in the remote Amazon jungle in the Brazilian state of Pará, have dwindled to only 41 members — and now 39 of them have dropped dead of what looks like poison. The neighboring white townsfolk don’t seem to be mourning the genocide much — in fact, the only person who seems to care at all is Jade Calmon, the official tribal relations agent assigned to the area. She wants justice for the two survivors, a father and his 8-year-old son. But racism is deeply entrenched and no one is going to help her get to the truth. Unfortunately, this is far from the first time the Brazilian federal police have had a tribal genocide to investigate. Chief Inspector Mario Silva and his team are sent in from Brasilia to try to solve the increasingly complex case just as a local white man is discovered murdered. Someone has done their best to frame the surviving Awana man, and the town is about to erupt.